Imagine sitting on a sandy beach near the cooling spray of a rushing waterfall. Zip lines whiz overhead and fellow adventurers scale granite walls or lounge in slow-moving paddleboats. This scene may conjure thoughts of a resort in Costa Rica or another exotic locale, but it also describes a new five-and-a-half-acre outdoor theme park in Rocklin. 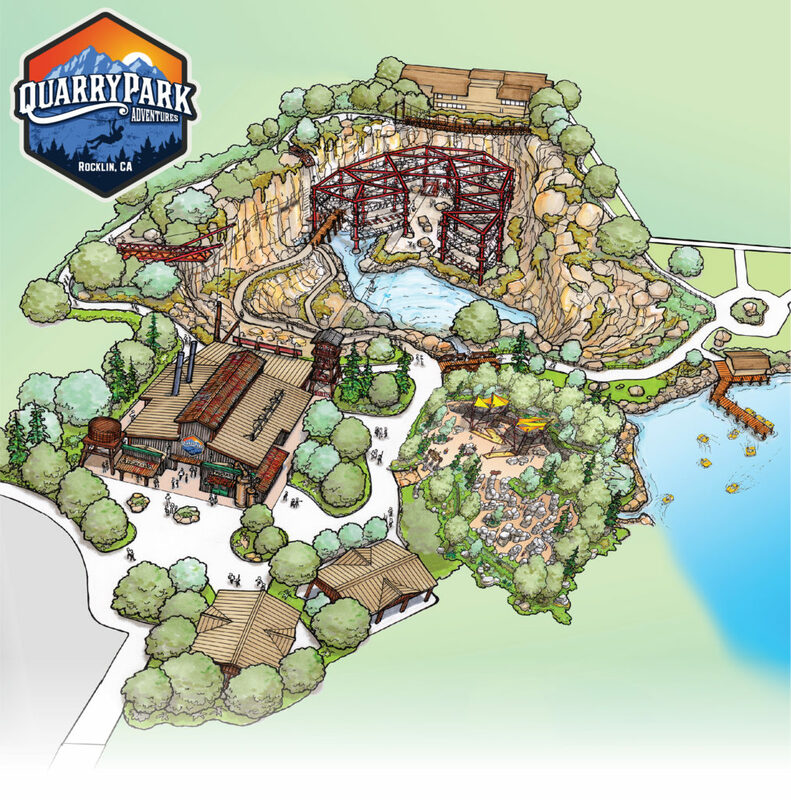 Quarry Park Adventures, set to open on Memorial Day weekend, will feature attractions like a three-level aerial ropes course, rock climbing stations and 2,800 feet of zip lines that can reach speeds of over 30 miles per hour. At Quarry Kids’ Kove, little ones ages 4 to 10 will find over 30 challenges, from balance beams and cargo nets to zip lines scaled to their size. Nearby, there’s a free-fall attraction and the Giant King Swing, which will catapult daring adults 120 feet over the rim of the quarry. “There are elements of this park that have never been designed before in the world,” says Quarry Park Adventures president David Busch, an El Dorado Hills resident who runs Legacy Family Adventures and has been developing entertainment parks throughout the world since 1972, including the Hawaiian Falls water parks in Texas, Wild Waters in Beijing, and Paradise Island at Cal Expo. Busch says Quarry Park Adventures will have a Gold Rush theme and will implement antique elements like mining machinery from the 1800s, hearkening back to the history of the site, which was once known as Capitol Quarry, or Big Gun Quarry. The quarry opened in 1864 and once supplied granite to buildings like the State Capitol and the U.S. Mint in San Francisco before it ceased operations in 2005. The Rocklin City Council approved the park last January and has contracted Bonsai Design—which also created the aerial park at Heavenly in South Lake Tahoe—to construct the attractions. In addition to a lake dotted with paddleboats and surrounded by covered picnic areas, the family-friendly park will feature a central gathering place in the form of the Rocklin Roundhouse, which will contain five restaurants, a gift shop and a 2,000-square-foot deck overlooking the quarry. Phil MacDougall, the park’s vice president of sales and marketing, says his team is still in negotiations with food vendors, but he envisions a space similar to Napa’s Oxbow Public Market, with specialty fare like artisan pizza and sandwiches, craft coffee and beer and wine from regional purveyors. MacDougall says the Rocklin Roundhouse and Quarry Kids’ Kove are scheduled to open by March, and the rest of the park will follow with a grand opening party set for Memorial Day weekend. According to Busch, Quarry Park Adventures has already sold about 700 season passes. “The cool part about this is, whether you want to go zip lining or just come sit on the deck with a beer and watch, there’s something for all ages, experience levels and interests,” MacDougall says. Hearing from YOU about your experience at Quarry Park Adventures is our pleasure, and every review helps us to ensure we deliver the best guest experience possible!